A gardener recently asked me what she could do about squash vine borer. She then proceeded to list all the recommended treatments she had tried already, ranging from shooting the vines up (literally, with a hypodermic syringe full of Bt), to putting out yellow bowls to catch adult moths, to watching a gazillion videos on YouTube, to praying to the bird gods to eat the little buggers. To answer her question I spent time reviewing a new and old publications, including a new review of the literature on this pest. Entomologists around the country also took the time to provide input on the question. As a result, I thought I would share some of the thoughts and ideas I gleaned with you. 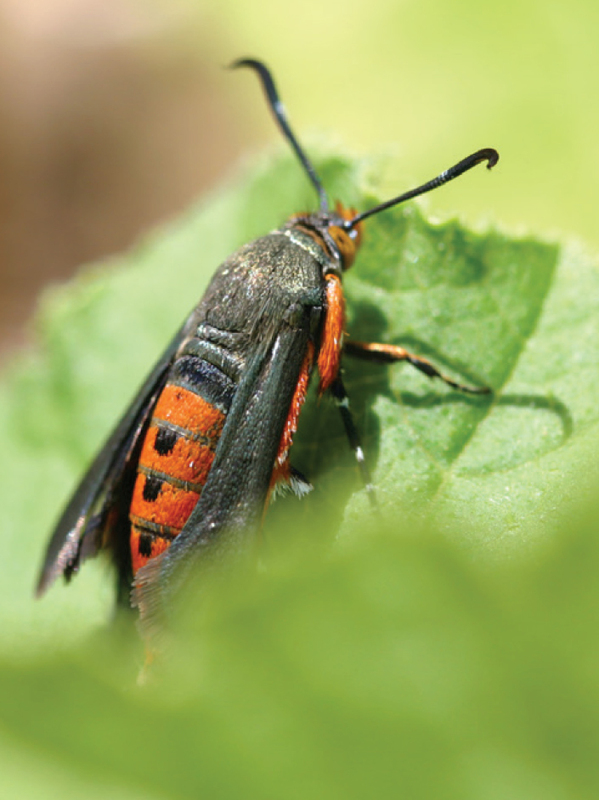 The squash vine borer adult is fast moving and wasp-like in appearance. Photo courtesy Kansas State Unversity. What is squash vine borer? First of all, if you don’t know about squash vine borer and you live in Texas, you’re either very lucky or you’ve never tried to grow summer squash in your garden. Squash vine borer (SVB) can be one of the most frustrating pests on zucchini and other squashes. With zucchini at least you can have some fun squashing squash bugs and their eggs. Not so with vine borer, which burrows down into the vine as a tiny caterpillar. Once inside the plant, the larval stage burrows in the plant stem or crown, disrupts water and nutrient flow, and causes wilting and eventual death of the plant. All the while it remains mostly invisible to the peering gardener. Adult squash vine borers are moths. They are attractive insects with bright red-orange scales covering the body and wings with a metallic green to black sheen. The hind wings are mostly clear. In flight, and in movement on the plant, they look much like a wasp. One of the first important things to know about a garden pest is when it is active, and its number of generations annually. Squash vine borer adults are out as early as April/May in Texas and remain active until as late as November/December. There are thought to be at least two (overlapping) generations in Texas, meaning they can be active throughout the summer and fall. Squash vine borer larvae live inside the stems of squash bushes and vines. Photo courtesy Kansas State university. Till and rotate. Because SVB overwinters (up to two inches-deep) in the soil underneath its host plant, these two actions are very important. Promptly pull up spent and dying vines and discard or destroy. If you don’t, these vines will discharge SVB until all the larvae inside the plants have completed their development. After the garden is finished in the fall, either roto-till or turn over all the soil in the vicinity of the vines with a spade. By doing so you will expose many of the underground pupae to the elements and to hungry birds. If SVB have become a perennial problem in your garden, consider skipping a year of production to clear the soil of these pests. If you are starting with a garden that has been well tilled, or not used for squash the previous year, consider using a floating row cover over next year’s crop. Floating row covers are lightweight fabrics designed to withstand the elements while allowing sun and wind through. If well secured and buried around the edges, they can also keep SVB adults from laying eggs on your new squash vines. If you use these in a garden that had a previous infestation, however, keep in mind some of last year’s borers may actually emerge under the fabric. Also, you will need to hand pollinate your flowers, or remove the row cover once the plants start to bloom if you want bees to pollinate your female flowers. Consider planting some of the squash types that are less attractive to SVB. Examples include white bush scallop, acorn squash, summer crookneck, Dickinson pumpkin, green-striped cushaw, butternut squash and zucchetta squash (suggested by Connecticut extension colleague Leanne Pundt). Hand removing/killing larvae by slitting the stems with a knife can also prolong the life of infested vines. This is time consuming (though satisfying in a disturbing way), and only suitable for home gardens with relatively few plants. Look for stems with oozing plant residue (frass) and slit open with a knife. There may be multiple larvae in a single stem. Carefully pry them out and use them to feed the birds or as fish bait (it’s only fair). Some people suggest staggering your squash planting dates, so that you have different aged plants through the summer. As you pull older vines succumbing to the borer, younger, still healthy, plants will take their places and continue producing. The gardener’s favorite bacterial insecticide, Bacillus thuringiensis, can be sprayed or injected into squash stems. Keep in mind that Bt degrades quickly in sunlight, so it will not provide much residual control and will need to be reapplied frequently. This is true of any insecticide on fast-growing plants like squash. Injecting Bt into the hollow stems of squash is another way to treat; however it is more time-consuming and not necessarily more effective. Spinosad is another organically derived insecticide with low toxicity similar to Bt; however spinosad tends to last longer on plant surfaces. Spray your plant stems weekly with spinosad for control of SVB, but do it in the evening when bee activity has ceased. Spinosad is toxic to bees when wet. Use of conventional insecticide sprays can also be an effective technique for controlling SVB. Because the eggs of the moth are laid solely on stems and vines, in the home garden insecticides can be applied directly to these sites, largely avoiding leaves, flowers and fruits. Several insecticides are labeled for such use, including acetamiprid (lower toxicity to bees), carbaryl, permethrin, bifenthrin, esfenvalerate and others. Sprays should be applied at the first sign of moths or larval entry and repeated weekly. Some growers may prefer to apply conventional insecticides up until the time of full bloom and then stop spraying, or switch to nematodes, natural Bt, or spinosad sprays. Be sure to check labels to ensure they are for use on garden vegetables, and how long you must wait after spraying before harvest. Surprisingly, for reasons not fully understood, small home gardens seem to have worse problems with SVB than large farms. Despite the challenges posed by this frustrating pest, you can still grow summer squash in Texas with a little persistence and patience. And maybe next year you’ll even have enough to share with the neighbors. Texas A&M Forest Service has conducted surveys for emerald ash borer for several years. Large purple sticky traps are placed in trees to attract and entrap the beetles. Ever since the dreaded emerald ash borer (EAB) showed up in Arkansas and Louisiana, tree lovers have braced themselves for its inevitable arrival in Texas. Then, in May 2016, the insect was discovered in a single surveillance trap near Caddo Lake in Harrison County in east Texas. In 2017 all was quiet, with no officially reported sightings; but this summer the beetle has been found in possibly three new counties. The EAB is a small but powerful beetle pest–an enemy of ash trees. Adult beetles feed on ash leaves and deposit eggs on the bark of their ash hosts. The eggs hatch and the tiny larvae penetrate the bark to feed on water conducting tissues inside the tree. Within 2-3 years the tree loses the ability to conduct sap, and succumbs to the infestation. Within 10 years of initial invasion all untreated ash trees in an invaded area are expected to die. When it comes to ecological destruction, the EAB is practically without peer among exotic insect pests. In areas where established, it wipes out virtually all species of ash trees in the genus Fraxinus. In 2017 scientists at the International Union for the Conservation of Nature declared five major species of ash trees in the U.S. on the brink of extinction due to the borer. A few years ago, I had the opportunity to travel to one of the hardest hit states to view EAB’s destructive power. Along the highways of Indiana, dead ash trees were obvious. They lined roadsides and peppered city parks and yards. Ash is a less dominant tree in Texas. But should EAB spread here, many beautiful ash shade trees in yards, streets and parks would be lost. According to Texas A&M Forest Service entomologist Allen Smith, EAB showed up in two new Texas counties this year. As of last week, Marion and Cass counties near the northeastern corner of Texas have detected EAB in traps placed out to monitor for the beetle. In addition, 6-7 additional traps in Harrison county (the initial site of entry into Texas) have detected the beetle. The emerald ash borer adult is relatively easy to identify by its size, shape and metallic green color. This week Texas Wildlife biologist, Sam Kieschnick, was reviewing pictures posted on iNaturalist, when a beetle from Tarrant County caught his eye. Submitted last summer by 10-year-old naturalist, Sam Hunt, the picture appears to show an emerald ash borer found in Tarrant County, just north of the Fort Worth Nature Center. Links to the picture were also viewed by biology student from University of Wisconsin, Alex Harman, and then by beetle expert, Dr. Henry Hespenheide, who both concluded it was likely EAB. Unfortunately the beetle was not preserved for positive ID, so the Texas Forest Service will attempt to verify the presence of the beetle in Tarrant County. If confirmed, this will be the deepest find yet of the beetle in Texas, and one of the farthest west occurrences of EAB. It will also signal a need for any valuable ash trees within 15 miles of the sighting to be proactively treated, according to standard control recommendations. The beetle spreads naturally from tree to tree, but large jumps in distribution are thought to occur only with the help of man. Foresters caution the public to never move hardwood firewood out of an EAB-infested county to avoid helping the beetle spread. Firewood cut from infested trees is likely to harbor live beetles that later emerge and infest nearby ash trees. For more information on EAB, it’s biology and control, go to http://www.emeraldashborer.info/ Also, reports of suspected EAB may be submitted through the Sentinel Pest reporting function of the Texas Invasives website. Experts from USDA there are ready to evaluate samples, but keep in mind some simple guidelines for sending in pictures. For more information about how to recognize EAB damage, check out this guide. Insect Updates will keep you informed about possible spread to the Dallas/Fort Worth area. Example of a picture sent by someone who never bothered to to make sure it was focused before sending. Yes, I know, it actually hurts to look at this picture. I get lots of images in email and on the web for identification. I get to see some amazing insects and good pictures this way, but I also receive a lot of really bad insect pictures. And since bad pictures don’t help your chances of getting a successful identification, it’s in everyone’s interest to take better pictures. So here are five tips for improving your chances to get an insect identified via email, your cell phone or other mobile device. Focus on the insect, not the background. Corollary to this rule: Look at your picture before sending. If the lawn at your feet is in sharp focus, but specimen looks like a fuzzy blob, you will need to retake. It will also look like a fuzzy blob to the entomologist. Take the picture in good light and fill your frame with the insect or damage, if you can. Brighter light (indirect sunlight or a well-lit room) will compensate for shaky hands and give the picture a deeper focus. Again, if you can’t see any details in your picture because it’s too far away, neither can the identifier. Take pictures from several angles. Sometimes key identification characters are hidden from a specific angle. Take a top and side view at least. Not a bad picture of a wheel bug, except that it’s not a wheel bug. It’s a leaf footed bug with the characteristic leaf-shaped legs obscured by the camera angle. To see another view of the same bug, click here. Provide information about where and when you took the picture. You would be surprised how many people neglect to mention that they photographed their bug while on a cruise last winter in the Caribbean, or that it was taken by Aunt Melba from New Zealand. Please include nearest city, county and date of photograph if you don’t want to be black-listed by an identifier who just spent an hour looking for an exotic insect that’s not in the field guides. Include information about the size of your specimen. Note: “big” “medium” “small” is not good enough. Whether something is 3 mm or 5 mm can make a difference in determining a species. Use your ruler. There you go. Five simple rules for getting an identification made by your pest control company, your county extension agent, or a university entomologist. Wait, I’m going to add one more. Use discretion when sending pictures. Sending someone picture after picture out of curiosity, or because you’ve just figured out what the closeup setting does on your iPhone, is not fair to the professional juggling lots of job responsibilities on the other end of the e-mail trail. It’s also polite to tell the identifier why you are submitting the sample. Did it bite or sting you? Is it an unwanted guest in your house? If so, how many are you seeing? Was it seen damaging a plant? If so, what kind of plant? Is it just for curiosity, or is your entire corn crop on the line? Curiosity questions will probably get a lower priority compared to the farmer or person suffering an allergic reaction to a sting. If your identifier asks you to fill out a form, please do. It makes that person’s job way easier, and allows them to keep serving you this way. Besides the identification authorities I’ve listed above, consider some of the online communities providing insect ids (at no cost) such as https://bugguide.net/ and https://www.inaturalist.org/ . You will probably have to follow similar rules for these sites, and they may not be as polite as your county Extension agent or pest control professional when you send really bad pictures. One ant may not be a big deal, but hundreds or more can be enough to drive you out of your home. This carpenter ant normally lives in a tree, but will gladly take up residence in an attic, wall or even hollow door. It’s ant season, and garden centers around Texas are swarming with folks looking for a quick solution to ant invasions. Ants have been the bane of humankind since before the first picnic. But who could imagine how much misery and anger a tiny little insect like an ant could produce? But of course it’s never just one ant that’s the problem. As I was recently reminded, one ant can quickly turn into dozens on the floor, on counter-tops and in the bathroom. My wife and I experienced that frustration a couple of weeks ago; but I should have expected it. The night before, as I was turning out lights I noticed just two little ants in the middle of the carpet of our living room. “Strange place for ants, but at least there are only two,” I thought. The next night at dinner my wife started noticing ants around her chair. To her horror and my consternation, ants were not only on the chair, but on the carpet, the hardwood floor and generally covering a swath of square footage from kitchen to back door. I should have predicted this event from my discovery the night before. Now folks, here’s one of the few benefits to being married to an entomologist. I was able to quickly identify the ants as fire ants. Knowing that fire ants nest outdoors, I checked the back door casement and sure enough found the entry point. Following the trail outside to the patio I saw the source of the trail was a small drill hole in the brick of our exterior wall. The ants had built a nest, at least temporarily, in our wall. Fire ants, I knew, are easily controlled with fire ant bait. Fortunately, I had some fire ant bait that I used at the end of summer last year, and had kept stored indoors through the winter. A quick sprinkling of the bait around the edges of the patio told me the bait was still highly attractive, with ants almost immediately picking it up and carrying it into the hole. Very satisfying. If I had used that bait on anything other than fire ants, it wouldn’t have worked. Fire ant bait is pretty selective for fire ants (harvester ants will also take it); other ants might sniff it, but will not eat it or carry it back to their nest. Neither of us have seen a fire ant in the house since I treated these ants. The first thing we did before attacking the outdoor nest was to clean the floor with a household cleaner (we used Murphy’s Oil soap on our hardwood floors, but most any soap will do). This does two things: it kills many ants quickly, since soap is a decent insecticide; but it also destroys the scent trail ants use to find food, water or whatever else attracts them. So my second piece of advice is to wash down any hard surfaces with soap to destroy the pheromone trail bringing the ants to your inner sanctum. If you can find where the ants are getting in this is also a good time to seal off those entry points with some silicon or other sealant. Sometimes just confusing the enemy and sealing their points of entry is enough, and keeps ants from returning for a while. But insecticides can be useful in helping kill and keeping ants out of the home. Decide where you need to treat and choose the best insecticide. For outdoor ants like odorous house ants, Argentine ants and fire ants, look for the nest. Follow the ant trail as far as you can. Often you will get an idea, like I did, where the nest or nests is located. A garden insecticide labeled for ant control, and a sprayer, is all you need to treat ant nests in the soil. A dust insecticide in a squeeze bottle will allow you to treat ants going into a wall void or hollow tree. Look under potted plant dishes, in clogged gutters, under mulch, stepping stones or the garden gnome–anything under which ants might find shelter. Once you’ve found and treated all the nests you can, use your sprayer (a hose-end sprayer is especially good) and apply a residual insecticide like bifenthrin to the soil around the house and to the lower foot or so of the foundation. This will help keep ants from re-entering the home for days. Indoors, the best choice for ant control is usually a bait. Sprays are messy and pose unnecessary risks, especially in the hands of us amateurs. Baits require less insecticide, therefore are safer, and they are generally more effective than sprays if you match the right bait to the pest. Don’t waste your money on the solid puck-type ant baits found on most grocery store shelves. Most household ants are sugar lovers, so look for liquid ant baits like Hot Shot® or Terro®. These can be placed around the home wherever ants are found. Though most of these baits are pretty low toxicity and child resistant, keep them out of reach of children, dogs, cats, ferrets, chinchillas or any other curious household pets. Carpenter ants and pharaoh ants (see the ant ID factsheet) will not usually be tempted by these sugar-based baits; but they both have specialized baits available online (Google ‘carpenter ant bait’ or ‘pharaoh ant bait’ and select one of the DIY retailers). One final piece of advice: be patient, but if DIY treatments don’t get you relief within a week, call a professional. Professionals do this all day and are more likely to correctly identify and select the right treatment. If you live in the Gulf Coast areas of Texas, now home to the infamous tawny crazy ant, good luck. You will probably need professional help to keep that particular ant at bay. Argentine ants can also be difficult to tackle on your own. You don’t need to live with an entomologist to successfully defend your home from ants. But having a pest control expert on speed dial can be a good thing. Does your lawn have chiggers? Keeping grass clipped short, use of a good repellent and proper use of insecticides can help. If my phone calls are any indication, this appears to be a whopping chigger season. Don’t know what I’m talking about? You should count your blessings. Chiggers are my personal worst nightmare. They are tiny mites, barely visible to the eye, that live on the soil surface and, in their larval stage, are parasites on humans and other vertebrate animals. Chigger bites itch terribly for 1-2 days, then slowly shrink to mildly itchy red marks that take 1 or 2 weeks to disappear. The only good thing I can say about chiggers is that, as far as we know, they don’t carry disease. Bites typically occur in the most sensitive of places, especially around areas of tight clothing (belt line, sock line) and thin, sensitive skin (you can imagine where). So why do chiggers seem worse this year? If I had to guess, I’d say it’s been our high humidity and above average temperatures the past month. Chiggers love hot and humid. The most common places to encounter chiggers is in bramble patches, woods and fields with long grass. But in a year like this, chiggers can be a problem even in manicured lawns. Chiggers are often said to prefer shaded areas, but workers in our blazing-sun-drenched turfgrass plots at the Texas A&M AgriLife Center in Dallas have annual problems with chiggers beginning around late May and early June. Your first protection against chiggers is a good repellent. DEET, our most popular mosquito repellent provides significant protection against chiggers. Dusting sulfur is a cheap and convenient alternative for some. Traditionally old-time Texans make it a habit to carry around an old sock filled with sulfur (in the pickup truck of course). When getting out of the truck they swing the sock against their shoes and lower legs to dust themselves before they set off to ride, roundup, plant, fix bob wire, or whatever else good Texans do these days. The larval chigger (circled) is the only biting stage in the chigger life cycle. Larval chigger season runs from May through August in north Texas. Drawing modified from Mullen and Durden, Medical and Veterinary Entomology. Artist: Rebecca L. Nims. Use a good repellent, applying to your shoes, socks and pants legs before stepping into chigger danger. Tuck your pant legs into your socks to make it harder for chiggers to get in your pants and find the tender places. Scrub yourself well in the shower after you think you might have been exposed. Chiggers typically take several hours to settle down and begin feeding. If you can shower before they begin chowing down, you can reduce the number and severity of bites. If you have chiggers in your lawn or backyard, consider using a liquid insecticide spray like bifenthrin. These sprays can significantly reduce chiggers. Before spraying, mow your lawn. This reduces humidity on that critical soil surface and makes it easier for sprays to contact the chiggers. If your lawn is full of dandelions, clover or other flowers, make sure you spray for chiggers in the evening to avoid spraying pollinators, like honey bees, while they are foraging. Follow all label directions to avoid harm to good insects. Good luck, and may the chiggers stay on the other side of the fence for you this year. For more information about chiggers, see our factsheet, E-365. The oak catkin mirid, Tropidosteptes quercicola, is one of our seasonal bugs that can show up for a week or two then disappears back into nature. Photo by Mike Merchant. Naturalists in Texas have no shortage of interesting insects to observe. If you were paying attention over the past couple of weeks, you may have noticed a small bug present in large numbers, especially around live oak trees. Given the large number of small brown plant bugs on Bugguide, I initially gave up trying to identify this insect beyond its family (Miridae, plant bugs), but thanks to entomologist Mike Quinn, the mystery has been solved. The oak catkin myrid (MEER id), Tropidosteptes quercicola, is a tiny but attractive, mottled bug. At only 6 mm it is easily missed most years (I’ve never noticed it before), but occasionally can become very abundant (like this month). An aggregation of oak catkin mirids on a doorway by Anthony Hernandez. Bugguide describes it as one of the most commonly collected mirids in oak-juniper woodlands of Central Texas. As its common name implies, it breeds on live oaks and is called a catkin mimic (blends in well with the male flower parts). It is very abundant on live oaks, especially. Little seems to be known about whether this bug feeds on the oak plant itself, or perhaps on oak pollen; but if you see it around your home, don’t worry. This is one of many native insects that occasionally reproduces in large numbers, but rarely causes damage. If it makes you feel better, these insects are likely considered delicacies by the song birds in your neighborhood. And without bugs we wouldn’t have the birds, or lizards, or toads or lots of things that keep life interesting and fun. Glossonotus acuminata, a comparitively large treehopper, sports an impressive hopper fin. Every year brings its own oddities of entomology. Some years caterpillars strip trees bare in the spring, other years grasshoppers arrive in hoards. This spring I’ve had a couple of reports of a small insect called a treehopper, sometimes in large numbers. Treehoppers are surely one of the most curious looking insects encountered by gardeners. They feed on plant sap, like many insects found in trees, but rarely seem to do much damage. The most distinctive feature of the treehopper family is an upright, fin-like structure arising from the shield behind the head (pronotum). In many species this structure resembles a tree bud or a thorn, and leading to one common name for this group, “thorn bugs.” There are thought to be about 280 species of treehoppers in the US, Canada and Mexico. This pretty green and black treehopper may be common on some oak trees this summer. Photo by Jonathan Garcia. Last week I was alerted to a swarm of treehoppers landing on a family’s car in Dallas, TX (thanks to Master Volunteer Entomology Specialist, Mary Morrow for this video). The pretty black and green insects were Smilia camelus, a relatively common treehopper on oaks. I’ve never noticed these insects before, nor have I had reports or questions about them in 28 years here in Dallas. It is just another example of how nature can surprise us, and of the amazing diversity of life one can find even in the middle of a city. The twomarked treehoppers are among the most common treehoppers across the central and eastern U.S.
Oaks support the greatest diversity of treehoppers, though each species has its own tree preferences. Another interesting treehopper I’ve photographed is the twomarked treehopper, actually thought to be a complex of closely related species. Adults of this genus are easily identified by two white spots on the back of its thorn-like horn, and by the white, cottony egg masses they lay on twigs. The exact species within this genus are difficult to identify, though some species specialize in just a few plants. Unknown species of Telamona treehopper nymph. Photographed from the Wild Basin Wilderness Preserve, Travis County, Texas, by Mike Quinn. 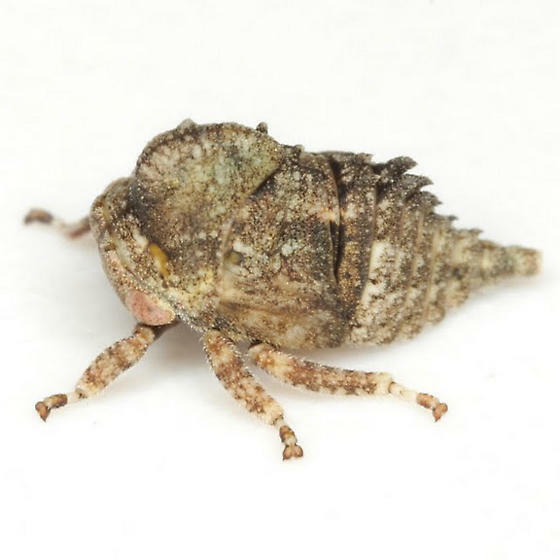 The nymphs of treehoppers look like something you’d expect to encounter at a prehistoric punk rock concert. I half expect, when looking at one through the microscope, to see it sporting a nose ring. Treehoppers go through a gradual form of metamorphosis, so there is a sort-of resemblance between the nymph and adult. But nymphs have a more razor-backed appearance and the prominent fin is usually not as evident. The nymphs commonly stay together after birth, and may be seen following an adult, presumably mommy. It’s surprising to me, given the beauty and oddness of treehoppers, that more is not known about these insects. So let me encourage anyone with a keen eye and clear camera lens to consider photographing thorn bugs whenever you encounter them, and submit your pictures to Bugguide.net. This is one small way to increase our knowledge of this beautiful and quirky family of insects. When is Sevin not Sevin? The name Sevin® has long been associated with flea control in pets, as well as with vegetable garden pest control. Any gardener who’s been around the block a few times has probably used the insecticide Sevin®, known generically as carbaryl. First introduced to the public in 1956, carbaryl was the first commercially successful product in the carbamate insecticide class. Since then, it has been a pest control workhorse for vegetable gardeners and fruit growers. It’s relatively low cost, broad spectrum activity, and relatively short (usually 3-day) interval between application and harvest made carbaryl a popular choice for growers. Its relatively low oral and skin toxicity to mammals also made carbaryl a favorite treatment choice for on-pet use against fleas. In recent years, newer, more powerful pyrethroid insecticides have come to dominate store shelves, making carbaryl harder to find. A few years ago the Sevin® trade name was purchased by the pesticide distributor GardenTech. This year, GardenTech is switching the active ingredient in Sevin® Insect Killer from carbaryl to zeta-cypermethrin, a newer pyrethroid insecticide. According to one industry rep, GardenTech “upgraded” the active ingredient in most Sevin® products to zeta-cypermethrin this year. Sevin® Insect Killer Lawn Granules are changing their active ingredient to bifenthrin + zeta-cypermethrin. The Sevin® Ready-to-Use 5% Dust is not changing immediately. It is still carbaryl, though this may also change. Manufacturers commonly change ingredients in brand name products; however I can’t recall a similar name change in an insecticide active ingredient so closely tied to a trade name as carbaryl and Sevin®. It will be hard for me to disassociate myself from thinking of Sevin® as anything other than carbaryl. It is something akin to changing the active ingredient in Tylenol® to something other than acetaminophen. So if you expect to be getting carbaryl the next time you go to the store, look carefully at the label. If it’s a GardenTech product you may be getting a different active ingredient than what you expected. That’s not to say the change will be bad. Zeta-cypermethrin and bifenthrin are both excellent active ingredients with longer staying power than the old carbaryl. In some, if not most, cases, it will likely perform better than carbaryl. But for some pests it may not. To verify the active ingredient in Sevin® or any other insecticide, look in the list of active ingredients at the bottom of the front label. You should see a generic active ingredient name followed by its percent content in the product by weight. This is one of the first things I look for when shopping for a pesticide. It’s a wise gardener who knows what they’re spraying on their plants. For more information, see our fact sheet on Understanding Common House and Garden Insecticides. Mr. Raid, from an early 1950s TV commercial, has influenced our thoughts about pest control. For many of us, the ultimate solution for cockroaches and bed bugs and other household pests is the “bug bomb.” Remember the old Raid commercials, where bugs flee from Mr. Raid, only to be followed home by the ominous cloud of death? The implication is that the cloud from a bug bomb is like a heat seeking missile, able to follow pests into their deepest safe houses. So how well do bug bombs really work? It turns out, not nearly as well as the animated ads suggest. Give a bed bug even a slip of cotton fabric to hide under, and even highly pesticide-susceptible bed bugs are unaffected by a total release fogger (bug bomb) blowing its top only a few feet away. This, according to a study conducted at Ohio State a few years ago. Pest control professionals have long known that bug bombs in kitchens and other areas rarely eliminate cockroaches. Rather they seem to drive pests deeper into walls and utility areas. It turns out that aerosol insecticides do not penetrate cracks and crevices where pests spend most of their time. Then there’s the growing concern about safety. A recent CDC report documented 3200 illnesses resulting from use of TRFs in just a few states between 2007 and 2015. Of these cases, 92% occurred in homes. Symptoms of exposure included cough, shortness of breath, chest irritation, vomiting, nausea, and cramping. 78% of cases were classified as low severity, and four out of the 3,222 cases were fatal. Some cases occurred when users did not vacate the treated areas while treating. Other times people entered too soon, or before the home was adequately aired. Moderate and severe illnesses occurred in men over 60, people with preexisting asthma, or who did not leave the treated area as instructed on the label. Insects that escape into cracks and crevices are tougher than TV ads would have you believe. Insecticide fogs are not designed to penetrate under or inside furniture or walls. This is no “smoking gun” report, implying that TRFs cannot be used safely indoors. Rather it seems to indicate that many people are not following fogger label directions, and thus reaping unhealthy consequences. And then there are those folks who guess as to how many bug bombs they need, rather than following the label. It seems to be a universal human belief that when it comes to insecticides, “if a little is good, more will be better.” But besides increasing the risk of pesticide overexposure, using too many TRFs can lead to explosions, especially when aerosol particles build up around an open flame, like a stove or water heater pilot. This fact helped elevate bug bombs into the follies section of Snopes.com (a myth busters website dedicated to exposing urban legends). In this case, Snopes investigated the idea that bug bombs might cause explosions and found that indeed explosions can result from using too many bug bombs at a time. One recent explosion, not only destroyed an apartment, but killed the owner’s cat. The lesson from all this is that foggers are not very effective for insects that spend most of the time hiding, such as immature fleas, cockroaches, bed bugs and ants. They can help rid a room (temporarily) of flying insects, or insects otherwise in the open; but these problems are much less common. There are many other, better, ways of managing cockroaches and bed bugs that you can read about in the Citybugs website. Personally, I don’t often recommend total release foggers. But if you choose to use one, take the time to calculate the size of the room (length X width X height) before your purchase. Then read the product label in the store to calculate how many TRFs you need. Do not buy or use more than recommended. It is a waste of money and potentially dangerous to you and your pets.